The Moto 360 2 could be just days away. It looks like it's almost time for the Moto 360 2, as Lenovo has posted a teaser to its Weibo page with what looks a lot like a smartwatch alongside the date September 8 and the words 'It's time'. No points for guessing that it will be. The announcement is set to take place in Shanghai, but sadly other than a date and place the teaser doesn't give much away. The image of the watch does show that the physical button has been moved up to the 2 o'clock position though, which matches images we've seen before, while the fact that it's partially submerged in the sea could point to water resistance. We've also heard that the Moto 360 2 could come in large and small sizes, so it needn't look quite so bulky on those with smaller wrists. 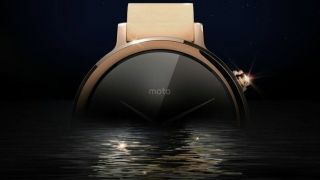 One model is said to be 1.37 inches, while the other is apparently 1.55 inches, which is still marginally smaller than the 1.56-inch display on the original Moto 360. It's likely that we'll also see lots of customisation options. Sadly it doesn't look like the flat tyre below the screen is going anywhere, though. There's also been talk of a Moto 360 2 Sport, with a rugged, water resistant design, though this model might not land until November. But with an announcement in a matter of days you'll hopefully be able to strap the standard Moto 360 2 to your wrist very soon. The Apple Watch will be tough to top.